Five years after the NATO war in Libya, a new war is being prepared against the North African country behind the backs of the world population. Like Afghanistan, Iraq, Yemen, East Ukraine and Syria, Libya will once again become the arena for war and destruction if the Western powers get their way. In the past week, a new war in Libya has come dangerously closer. Last Sunday, a proposal for a new “national unity government” in Libya was presented in the Moroccan seaside resort Skhirat under the watchful eye of U.N. representatives. 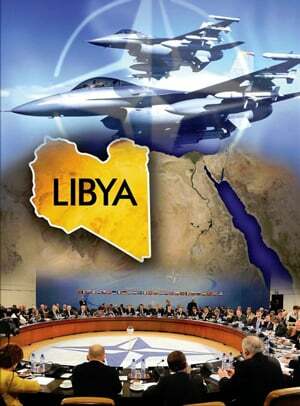 The main task of the new U.N. puppet government will be to make an official appeal to the so-called “international community” and allow NATO to carry out a new military intervention in Libya under the pretext of a struggle against the Islamic State (ISIS). While negotiations were underway in Skhirat, British Royal Air Force military jets were already flying over the Libyan coast. On Sunday evening, Fathi al-Majbari, head of the Libyan presidential commission and designated Libyan prime minister, presented the list of members of a new government in Tripoli with thirteen ministers and five state secretaries. He plans to present his agreement to the parliament in Tobruk. The latest proposal has nothing to do with any kind of “will of the people.” Rather, it came about as a result of an ultimatum by the U.N. Although all nine members of the presidential council were handpicked by U.N. experts, two of them protested and refused to put their signatures on the proposal. In reality, however, the aims of the U.N. in Libya have nothing to do with either the “restoration of world peace,” or the “war on terror,” but rather control of the country’s resources, above all oil and natural gas, as well as strategically important access to the entire African continent. The NATO powers already reduced the country to rubble five years ago, killing approximately 30,000 people. Libyan head of state Muammar Gaddafi was brutally murdered. Before his assassination, Western intelligence agencies had already carried out a covert war against the Libyan government and systematically armed Islamist groups. This prepared the way for the current chaotic situation in Libya as well as the development of ISIS in North Africa. The resulting chaos is now being used as a pretext for a renewed military intervention in Libya. Today, at least three governments and six different militias are struggling for power in Libya. The national congress in Tripoli replaced the so-called National Transitional Council (NTC) in the summer of 2012. Two years later, Islamists built the so-called government of national salvation in competition with the internationally recognized House of Representatives that had fled to Tobruk. In 2014, ISIS began to fight ever more fiercely for control of oil resources and developed its presence along the strategically important Mediterranean coast. Since then, the U.N. has made a desperate effort to bring together the two competing governments in Tripoli and Tobruk and enforce support for a “unity government” that would sanction a further Western military intervention. This would give the Western powers a free hand to “protect” the oil refineries and the ports from the access of ISIS and to place them under their direct control. Libya is the country with the largest oil and natural gas reserves in Africa. At the moment, the imperialist powers are collaborating in opposing ISIS, but at the same time there is a struggle behind the scenes over which country and which large energy corporations will have the final say and receive access to the desired resources. At the end of January, the Pentagon made it known that it was planning a new war in Libya. General Joseph Dunford Jr., head of the U.S. Marine Corps made it clear that U.S. President Barack Obama himself approved a new bombing campaign. Dunford declared that a “decisive military action against ISIL [ISIS]” is being planned and will take place “in conjunction with the political process” in Libya. “The president has made clear that we have the authority to use military force,” he added. Next to the United States, Italy is playing a leading role in plans for a new campaign against Libya. Italy has a long and bloody colonial history in the regions of Cyrenaika and Tripolitania, which make up a large part of Libya today. Italy has participated in the exploitation of Libyan natural resources since the fascist dictatorship of Benito Mussolini with the energy corporation ENI (formerly Agip). It also played an active role in the NATO bombardment five years ago. Italian marines have been preparing for months to intervene militarily on the Libyan coast and to secure the offshore oil refineries and transfer ports. A full year ago, at the beginning of February 2015, Defense Minister Roberta Pinotti publicly declared: “Italy is ready to lead a coalition of regional countries in Europe and North Africa in Libya in order to halt the advance of the kalifates, which have already come up to 350 kilometres from our coasts.” She wanted to prepare five thousand Italian soldiers for this purpose. Italian Prime Minister Matteo Renzi has insisted on a U.N. mandate in order to carry out a coordinated military intervention. In May and June, 2015, the EU Military Committee (EUMC) laid down concrete conditions for the intervention. EU High Representative Federica Mogherini passed a resolution that planned the expansion of the existing EU mission in the Mediterranean and in Libyan territorial waters and on the Libyan mainland. Conditions were specified in which smuggling boats would be destroyed off the Libyan coast and both smugglers and ISIS terrorists could be pursued on Libyan territory. The EU worked out scenarios in this context for the securing of existing institutions such as airports and oil refineries and opened the way for extensive military, police and intelligence agency operations in Libya. All 28 member states agreed to the plan. The German elite has long been of the opinion that Germany’s nonparticipation in the NATO war in January 2011 was a mistake and that the geo-strategic and economic interests of Germany must be carried out above all by military means.